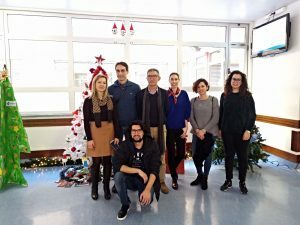 Future Balloons, as a part of the Tichron’s project, is developing an e-learning tool for mobile phones and tablets, aimed at empowering children with chronic diseases, in which the Coimbra Paediatric Hospital collaborates as one of the associates partner. In this regard, on January 9th and 10th 2019, a meeting was held with the team of the Cantabrian Health Service (SCS), leaders of the project, to solve various issues related to the development of digital support content and tools that the application contemplates. During the visit to Coimbra’s Hospital, on January 10th, certain details were agreed with the Hospital Administrator, Dra. Ana Rosete and the Director of the Hospital, Prof. Dra. Guiomar Gonçalves Oliveira, on the development of the partnership. The project was also presented to several professionals and members of the medical team, with whom we discussed the different characteristics of the application. The project started in April 2018, right now the three technological members of the project Future Balloons, CTIC and MEDES with the advice of SCS, U.Minho and Accomip, are developing an application which includes an e-learning tool (as mentioned before), a chatbot, and an interactive game for children between 8 and 16 years old with diseases such as asthma, diabetes or obesity. This app will also be aimed at parents and teachers, it will provide information about the diseases, and will also have a monitoring component that facilitates the monitoring of children.